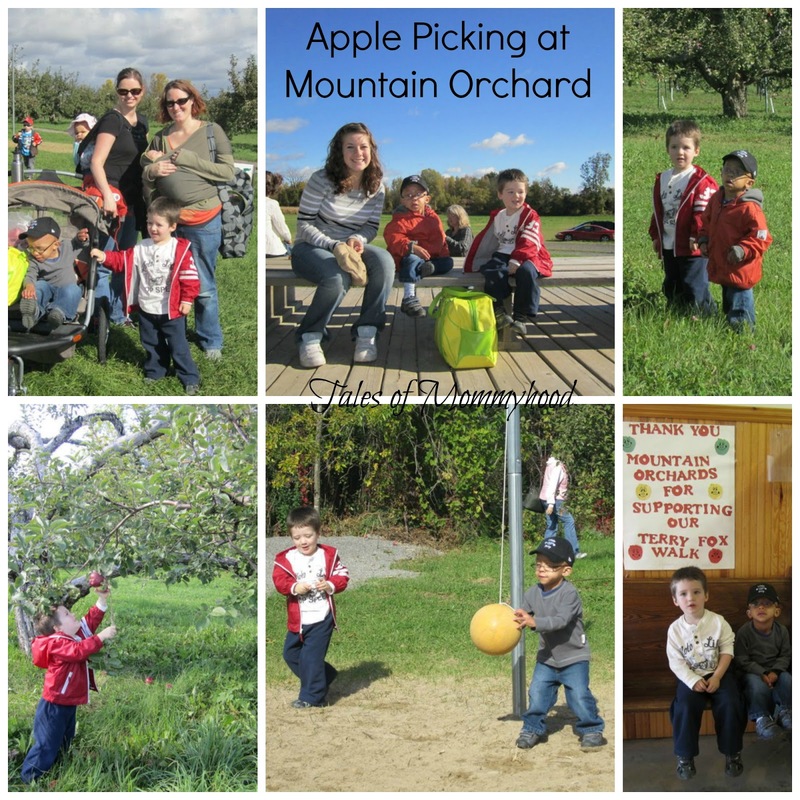 Tales of Mommyhood: It's apple picking season! In September 2010, a tradition was started with our family and good friends of ours (Heart Mom). She and I, along with my teenage cousin, took our children to Mountain Orchards for the very first time. The next fall we made arrangements to go back together, but this time the little ones were able to enjoy it as well. The 4 kids always have fun together, and being outside on a beautiful day was so much fun for all of us. 2012 came and we made the trek back again - this time there was a new addition, as our friends had their 3rd child the previous spring. 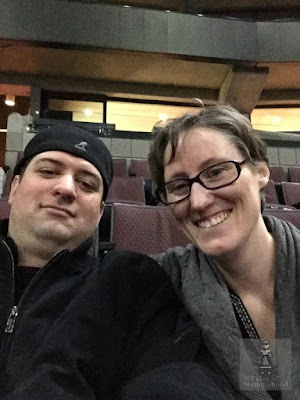 You can read about our third visit HERE. 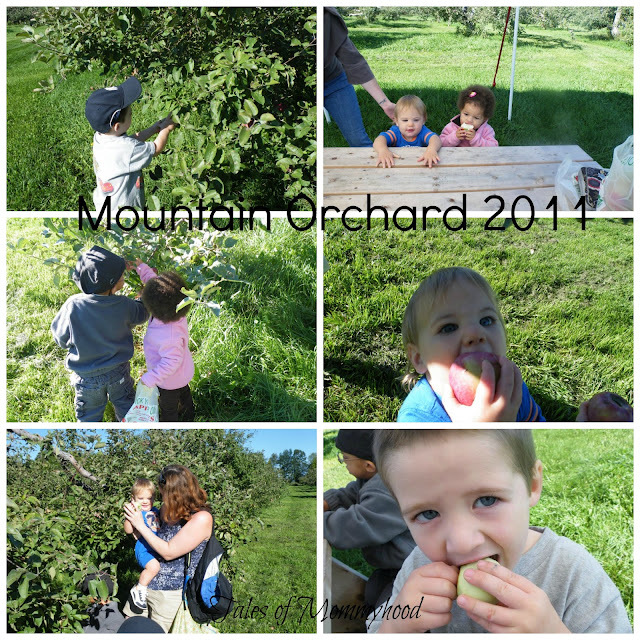 With apple picking season upon us, I thought it would be a great time to revisit - we have already made our plans to visit this fall and I am very excited. If you live anywhere near the Ottawa area, I highly recommend Mountain Orchards for the great family fun - it's free (well, you need to pay for your purchases) but parking, wagon rides (only available on weekends), hay jump, hiking, corn mazes are all at no cost. I would suggest you go on a saturday or sunday - this will give you the opportunity to try the amazing apple cider donuts! If you are not near Ottawa, then I would suggest that you look up the local orchards in your area and choose one to visit. There is something delicious about eating freshly picked fruits! This year on my list to make after our visit is Apple Pie, Apple Crisp, Apple Cake and Apple Sauce! What are your favorite things to make with apples? So happy it is apple picking season, love apples! me too! The kids have a blast, and I get to bake up a storm!